The X-BERG CHALLENGE is a truly unique event where trail runners, mountain bikers and paragliders are pitted against each other in a thrilling multiday adventure race with a twist. 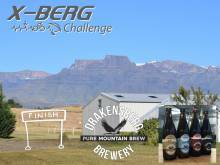 Established in 2013, this epic event takes place in the stunning Drakensberg Region of South Africa. The challenge is to fly, or run, or cycle along a carefully calculated route in the Drakensberg. Participants need to use skill and cunning to self-navigate between set turn points and work out the fastest route for their sporting discipline. This exciting race is live tracking enabled, so all your friends, family and fans can follow the excitement in real time via the internet! No entries on the day, only pre-entries permitted. Limited numbers, only 45 entries. Post-event overnight Champagne Valley - suggested accommodation at Mountain Splendour Eco Resort or Inkosana Lodge for this night (own account). Optional Post-race breakfast 08h30 am in Champagne Valley for those wanting to join (own account).